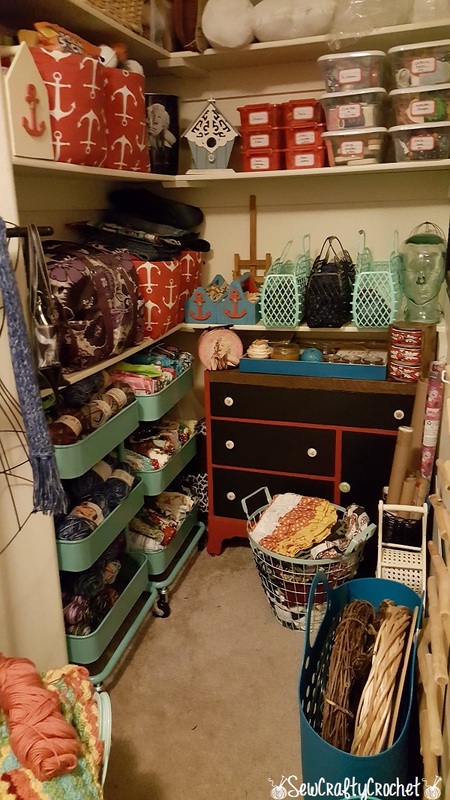 Last summer, I set up my craft room in our large hall closet, and I'm always adding new things to my craft closet. 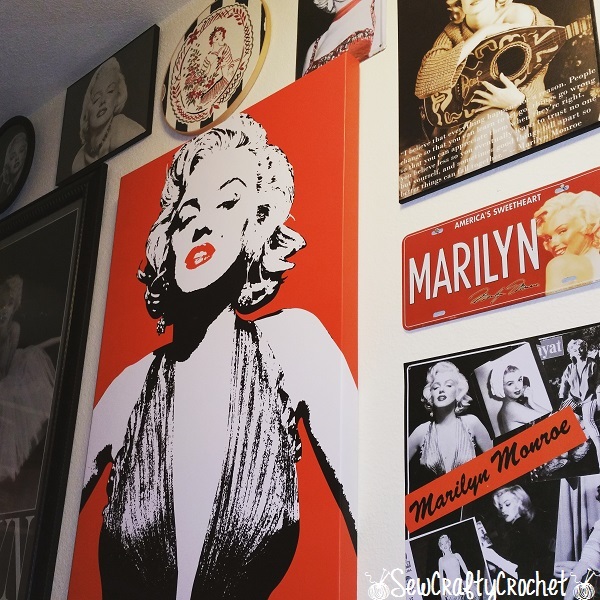 While shopping around various places, I've found several metal baskets/carts, jelly baskets/bags, a comfy chair, a Marilyn Monroe clock, a Marilyn Monroe canvas, a locker, a metal dress form, and a window! I'm so glad I finally have my own cozy room to sew, paint, and store my junk. My new chair is too wide to slide into the desk, but that's okay. I made the caravan sewing machine cover recently. I found the Marilyn Monroe clock at Goodwill today for about $4. While crafting, I enjoy watching Army Wives , Grey's Anatomy, and Orange Is the New Black on Netflix on my small TV. I originally had our Wii in my craft room, but I had my husband replace it with our PS3. It's so much better. Don't worry. When I'm hiding out in my craft room, he plays games on the PS4 in the living room. I was using a metal folding chair for when I sew, but it wasn't very comfortable. I was happy to find this sturdy chair at the local Goodwill for five bucks. When I put it in my cart, other customers kept eyeballing my chair and telling me it was a really nice chair. You're darn right it's a nice chair! 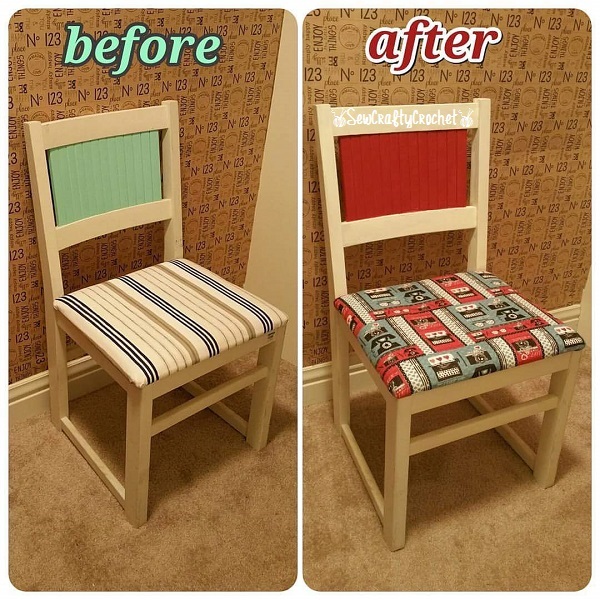 I covered the seat with my new favorite fabric, Vintage Desktop. I touched up the white paint a little, and I painted the blue section of the chair red. inside my locker... I've been wanting a locker for a long time. I don't know why, but I think lockers are so cool! I really love that this little locker has drawers, too, and it's blue, so it matches the color scheme of my craft room. I picked some of my favorite fabrics to put in embroidery hoops and hang on the wall. I recently bought the wall mail/magazine rack thingy... like two weeks ago, and I store my crochet pattern book in there. It's really convenient to have them by my desk. Since my craft room is a closet, there's no window. So I bought one! I was so happy when I stumbled upon this cute window planter online. I stapled some fabric behind it to make it look like a real window looking outside, but I didn't like it, so I took it off. I kinda like it as is. It's a planter, but I use it to store my paint brushes. I am also in love with my dress form and my cart. 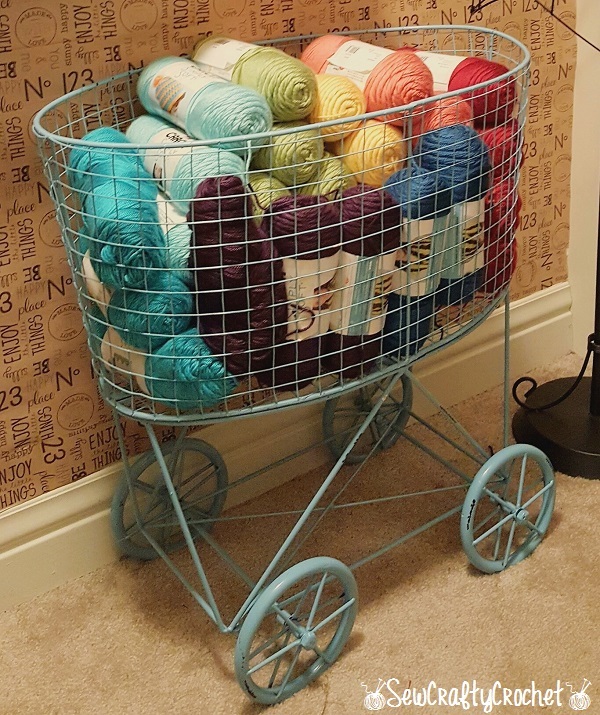 I'm currently using my cart to store the yarn I'm using for my Crochet Temperature Blanket, which is in the jelly bag next to the cart. This is my new Marilyn Monroe canvas on my Marilyn wall. I tried to resist, but I went back to the store the next day to get it. I was so glad it was still there! 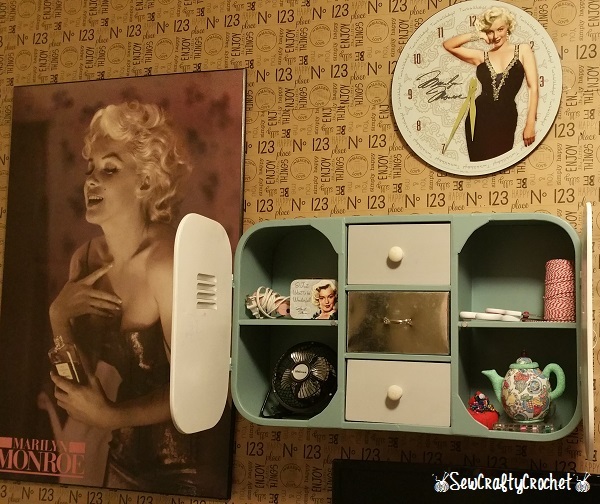 It looks perfect on the Marilyn Monroe wall in my craft room. I love the bright red background. This is the storage area of the closet. Yes, I have two of those Ikea Raskog Utility Carts. One is for yarn, and the other is for my fabric stash. I really love my antique dresser, and I'm so glad I decided to paint it red. It was green before. The storage bins are from the Dollar Tree. I covered fabric bins with red and white anchor fabric to make them go along with my craft room's color scheme of red, white, black, & blue. I'm really enjoying my craft room, and I've been busy creating new things that I can't wait to share on the blog, so stay tuned! Just think, I am sitting at that desk in that chair right now! What a great space you have! So much to create with and you've inspired me. Thank you! 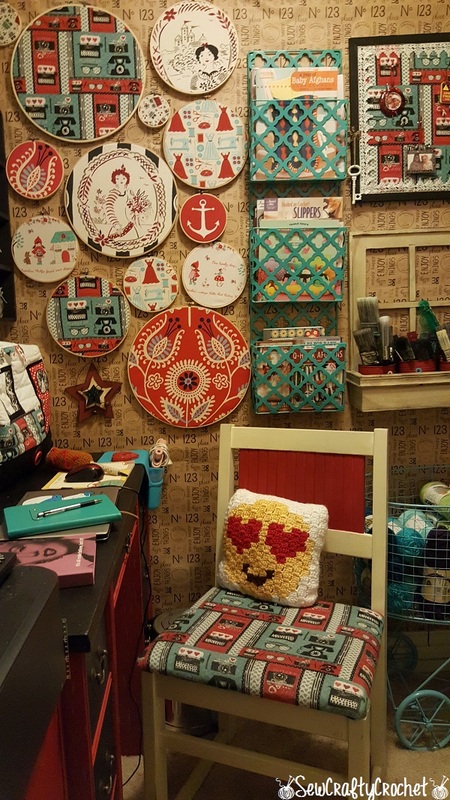 I'm glad you found some inspiration in my craft room! Thanks for stopping by!! How awesome!!! The color scheme and wall art is fantastic, what a delightful space! Thank so much! The Vintage Desktop fabric inspired the color scheme. Thank you so much for sharing your creative space with us. Have a fabulous weekend. Thanks so much, Stephanie! I'm glad you like it! Have a great weekend!!! Great use of a smaller place! I love the colour combo. Did you 'wallpaper' the walls with paper? Looks great! Hugs! 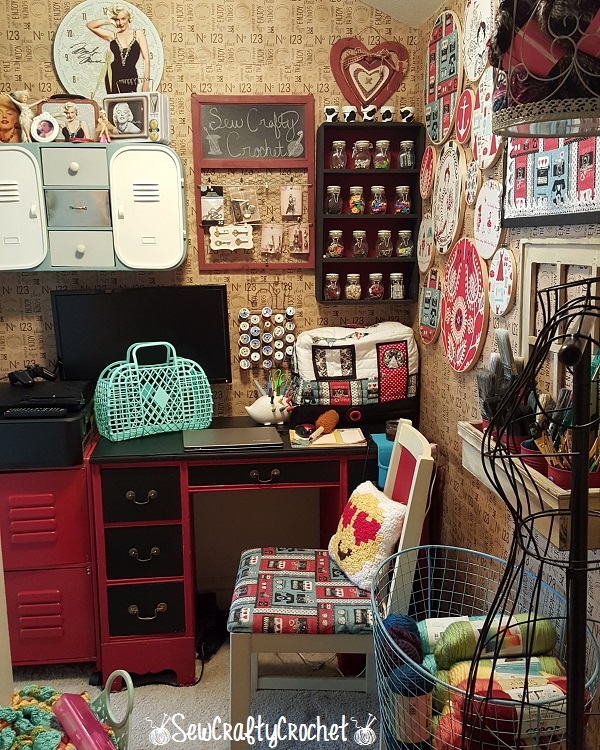 Fun Fun Fun is this retro vintage creative space. I would never want to leave. Keep creating! Thank you! I love all things retro! I don't want to ever leave, but I have two children, so... I have to come out sometimes. lol Thanks for stopping by! such a fun space to be in. 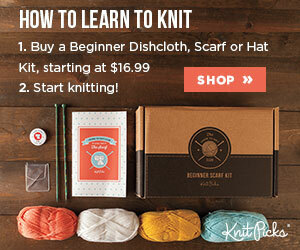 I love the C2C pattern as well. and I may have to do a temp blanket next year myself. I love all the bright pops of color you have used everywhere. Thank you! 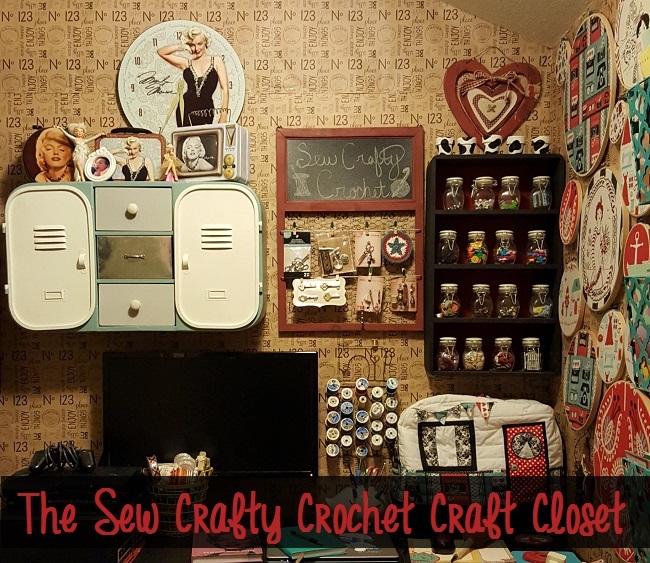 I really wanted to make my craft closet into something special since it is just a closet. I'm glad you like it! And if you do a C@C temperature blanket, I recommend splitting it into two blankets unless you a HUGE blanket. I'm not even half way, and I can already tell this blanket will be big enough to over my king sized bed. I just wanted a throw to use on the couch while I watch TV! lol Anyhoo... Thanks for stopping by! I love your craft closet. It's so perfect! The paper on the walls, that cute little locker -- I've never seen one like that before. Neat! Thanks for sharing your space! Thanks Leanne! I'm glad you like my little space! Have a lovely weekend! What a delightful space you have created! Size really doesn't matter when it comes to our creative spaces...our "artful" minds will adapt. WoW, love what you done with your closet! The decor is fabulous and truly a statement that creative spaces can come in all shape and sizes! Thanks for sharing your adorable space! Thanks for joining the party Monroe! I love what you have done with the place!! Glad I'm not the only one that fills their space (and home) with things from Goodwill!!! Thank you so much for the inspiration. 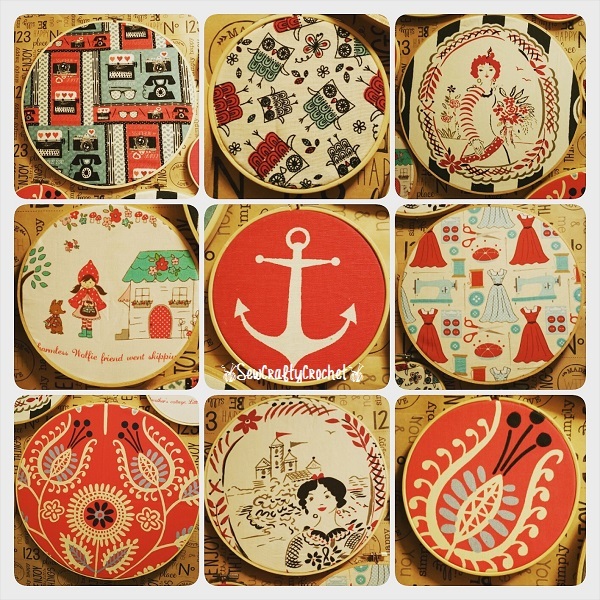 Your fabric filled embroidery hoops are fabulous!!! Good for you making your delightful creating space in yout hall closet!! Excellent idea! I can just see you doing a "Happy Dance" at Goodwill when you found that clock!! Wow, and for $4.00!! I spied a cute star pincushion I might just have to make! Happy continued creating!!!! Great space! 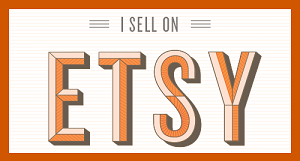 You have put together a wonderful grouping of items and it's so fun too! 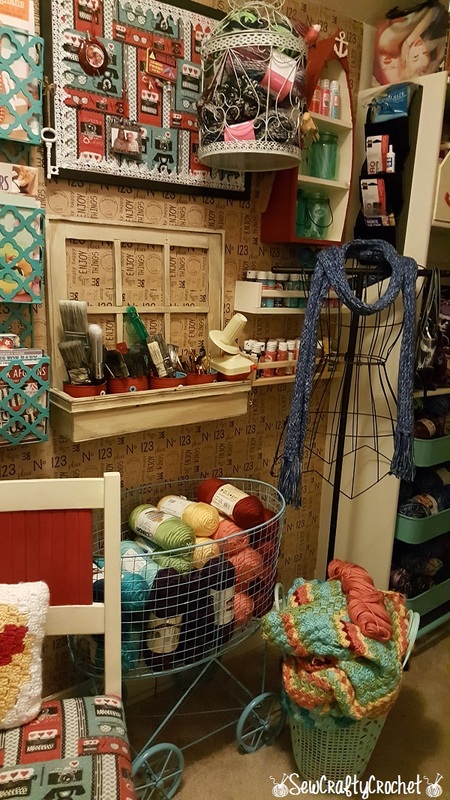 Love your locker, but am in love with the rack holding your yarn! That piece is so perfect! Your afghan is gorgeous by the way! So glad you joined the party! Thank you for sharing your space! 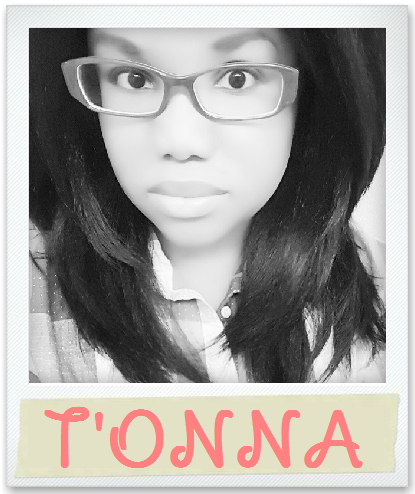 Thank you so much, Doni! Absolutely love your Hollywood and bold color theme! Just fabulous! I agree with what others have said, you can hardly believe that is a closet! You've done a order full job transforming it and making it your own. I love your color scheme and all your Marilyn Monroe touches, just divine. What an awesome creative space! I love the chair re-do. Everything is displayed so nicely and your organization is wonderful! Thank you for the tour. great space and fun colors! great place to create-thanks for sharing! What a great space! 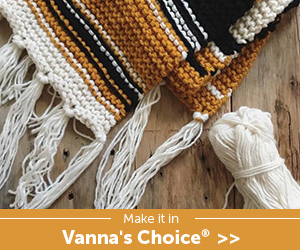 I LOVE the fabric and the colors that you chose too! Thanks so much for sharing! !